NASA’s Wide-field Infrared Survey Explorer (WISE) has found the very first asteroid that (more or less) shares an orbit with Earth! Called 2010 TK7, this asteroid is about 300 meters (roughly 1000 feet) across, and is the first in an up-to-now theoretical class of objects called Earth Trojans. An international team of astronomers reveals that an asteroid discovered late in 2010 is the Earth's first known Trojan asteroid. 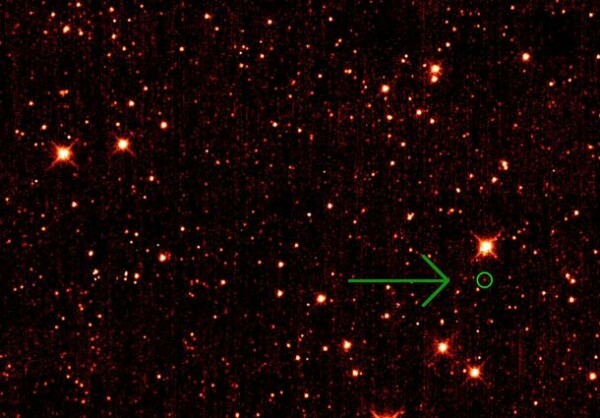 In the July 28 2011 issue of the journal Nature , astronomers announce that the as-yet-unnamed near-Earth asteroid with the temporary designation 2010 TK7, shares the Earth's orbit with it. 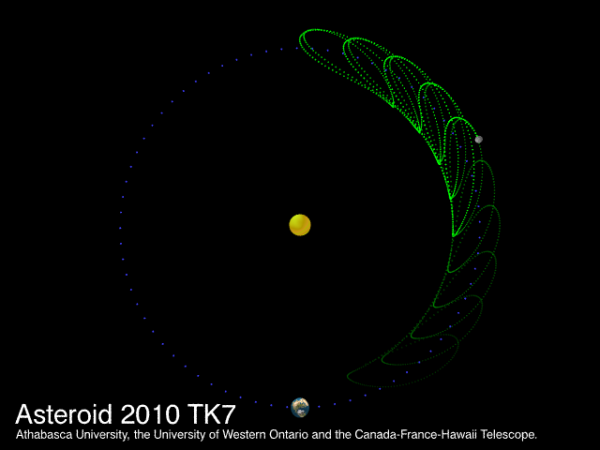 As the asteroid and the Earth both orbit the Sun, 2010 TK7 remains in step with our planet, remaining ahead of us as seen from Earth. The asteroid moves in an elaborate path that brings it sometimes closer and sometimes farther from our planet. The Earth and the asteroid remain in sync however, with the asteroid always preceeding the Earth as they both move around the Sun. 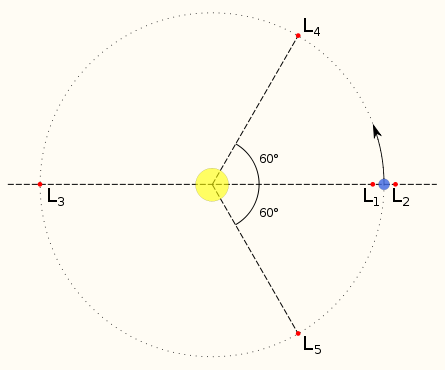 That asteroids could perform such complicated motions while staying in step with their companion planets was first proposed by Joseph Louis Lagrange in 1772. The first asteroid discovered to have this property was asteroid 588 Achilles, spotted by Max Wolf in 1906, and which accompanies the giant planet Jupiter. As the largest planet in our Solar System weighing in at over 300 times the mass of the entire Earth, Jupiter is now known to have thousands of such asteroids. Frequently called "Trojan" asteroids because of the tradition of naming these bodies after the heroes of the Greek and Trojan War as immortalized by Homer in the Iliad and Odyssey, only the planets Jupiter, Neptune and Mars were known to harbour such objects until now. Earth's Trojan companion - Asteroid 2010 TK7 from conversationEDU on Vimeo. The vast majority of asteroids orbit the Sun within the main asteroid belt between the planets Mars and Jupiter, and thus remain far from the Earth. Near-Earth asteroids (NEAs) represent a small population of asteroids which have been kicked out of the asteroid belt by various complex processes, and which may pass much closer to the Earth at times. Asteroid 2010 TK7 is a near-Earth asteroid in the sense that its orbit takes it much closer to Earth than main belt asteroids ever do, but it does not constitute a threat to our planet. Quite the opposite in fact. Other NEAs move around the Sun in ways which are uncoordinated with our planet, and this allows for some degree of danger from collision. How was the nature of 2010 TK7 discovered? Asteroid 2010 TK7 was discovered by the Wide-field Infrared Survey Explorer (WISE) satellite in October 2010. 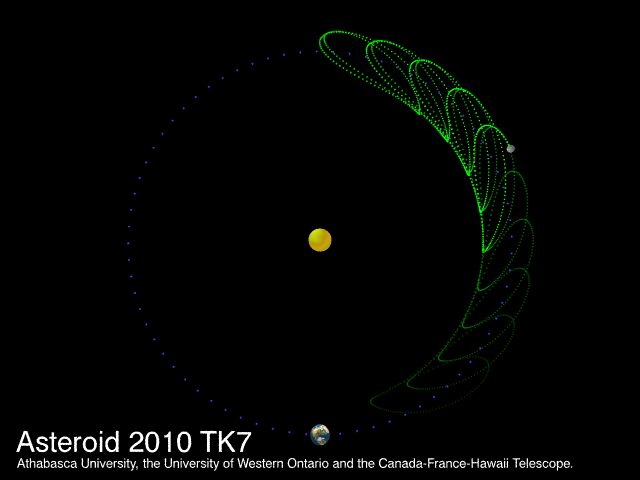 Shortly after this, the possible co-orbital nature of the orbit of 2010 TK7 was pointed out by Martin Connors (Athabasca University in Alberta, Canada). Follow-up images of the asteroid were taken by Christian Veillet, Director of the 3.6 meter Canada-France-Hawaii Telescope in Hawaii, to refine the asteroid's orbit once it became favorably placed in the night sky. Based on this new information, Paul Wiegert (The University of Western Ontario in Ontario, Canada) was able to perform computer simulations of the asteroid which confirmed the Trojan character of its motion. Trojan asteroids are the best-known and studied asteroids of a class called "co-orbital asteroids", so-named because they can share a planet's orbit with it. What we call "Earth co-orbital asteroids" (or ECAs) here are asteroids in a 1:1 mean-motion resonance with the Earth. That means that they go around the Sun in the same amount of time as the Earth does, that is, one year. Though the Earth and the asteroids don't always move at the same speed at every instant, their average (or mean) motion is the same, hence the name 1:1 mean-motion resonance.